ISSAOUI C.1. KHENOUSSI N.2. HAJSAID A.1. SCHACHER L.2. ROUDESLI S.1. Electrospinning has been recognized as an efficient technique for the fabrication of polymer and composites nanofibers. Various polymers have been successfully electrospun into ultrafine fibers in recent years mostly in solvent solution and some in melt form. Polystyrene (PS) dissolved in N,N-Dimethyl Formamide (DMF) was electrospun to obtain fibers of diameters in the range 600nm. The effects of the concentration, voltage and working distance were observed by scanning electron microscopy (SEM). The optimum solution was used to elaborate a composite single walled carbon nanotubes (CNTs) / polystyrene. We have reached 2% of CNTs in the polymer matrix when adding oligo-para-methoxy-toluene (OPMT). The diameters decreased when using OPMT and the surface is smoother. The influence of OPMT is noteworthy into diameters nanofibers. Diameters attain 1.5µm in the case of PS/CNTs (1%). However, they get to 500nm in the case of PS/OPMT/CNTs (1%). .
GHANMI H.1. GHITH A.3. FAYALA F.2. BENAMEUR T.1. This paper aims to predict ring spun yarn tensile properties using non-correlated HVI fibers characteristics and some construction parameters. For this purpose, five different cotton blends were processed into yarns having different metric numbers (Nm13, Nm19, Nm21, Nm31 and Nm37). Each count was spun at different twist levels (450 trs/m, 500 trs/m, 650 trs/m, 750 trs/m and 850 trs/m). To fulfill this goal, one of the soft computing approach tools is investigated namely fuzzy logic system. The prediction accuracy of this approach was estimated using four performance criteria specifically correlation coefficient, mean square error , mean absolute error and mean relative percent error. The model prediction accuracy was found to be very interesting. Our study is very useful for industrial applications since it permits the quality management prediction based on input variables namely fiber characteristics and process parameters . During this study, lignocellulosic fibres from marine biomass namely Posidonia oceanica was investigated as reinforcing elements for thermoplastic matrix-based composites. P. oceanica a dominant Mediterranean Sea grass was used as a filler to produce biocomposites. These natural fibres are sustainable low cost by-products and environmentally friendly raw materials. Several biocomposites films were prepared from P. oceanica and BC-LBI01 matrix, using a Brabender mixing device at different fibre loadings from 0 wt. % to 50 wt. % (w/w with respect to the matrix). The ensuing films were characterized by their morphological using scanning electron microscopy (SEM). Besides, their thermal and mechanical properties were established by differential scanning calorimetry (DSC) and dynamic mechanical analysis. The obtained results show that P. oceanica enhanced the properties of the initial matrix and that these natural elements can be considered as promising fillers for preparing biocomposites materials..
CHERIAA R.1. BEN MARZOUG I.1. SAKLY F.1. During their lifetime, textiles are confronted to various constraints such as laundering, drying and ironing. In fact, ironing is a process of smoothing out wrinkles and/or removing moisture by heat, pressure and friction, often with application of moisture or steam. The present contribution deals with the characterization of smoothness appearance, low-stress mechanical and dimensional properties of cotton, cotton/polyester and polyester plain fabrics after repeated cycles of laundering/ironing. The results show that ironing can preserve an appreciate smoothness appearance during laundering cycles and also reduce the effects of laundering on low stresses mechanical properties..
GARGOUBI S.1. BOUDOUKHANE C.3. LADHARI N.2. 1LABORATORY OF TEXTILE ENGINEERING, UNIVERSITY OF MONASTIR, TUNISIA - LABORATORY OF DYEING SERVICES AND TEXTILE TREATMENTS, CHIMITEX PLUS, TUNISIA. In recent years, we have started taking a different view on waste and we are finding ways to use it in creating new products. The concept of upcycling has received great attention from numerous fields. 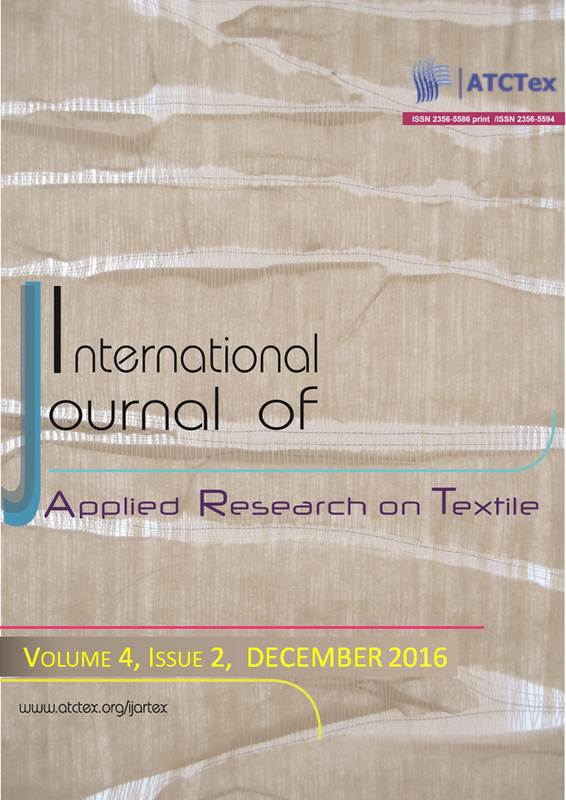 The aim of this paper is to identify if upcycling of agriculture by-product is possible with textile industry through the use of pomegranate peel for dyeing. HPLC analysis of the methanolic extract obtained from the pomegranate peel powder showed that various phenolic compounds were identified. Effects of dyeing conditions including pH values and temperature on the colors of dyed polyamide fabrics were studied. The dyeing properties were evaluated by measuring K/S values. Fastness properties have been also evaluated. .
REZIG S.1. JAOUADI M.1. KHOFFI F.2. MSAHLI S.1. DURAND B.2. The influence of temperature, duration and soda concentration on the extraction yield, linear density, diameter, Tenacity and lignin ratio of Typha Stem fibers has been studied. A factorial design of experience has been used to identify the optimum operating conditions, equations relating the dependent variables to the operational variables of the extraction process were established. The optimum extraction condition was determined by the statistical study using response surface and desirability function. The morphology of the obtained fibers and chemical constituents were determined. Fibers, extracted from stems of Typha with the optimum process, have a lignin content value about 22,05% like alfa fibers and Typha Domingensis, alpha-cellulose value about 51,3% similar to jute bast fibers, extractives content value about 3,6%, starches content value about 4,25% and ash content value about 3,2%. Finally, the characteristics of the optimum Typha fiber were compared to those of other vegetable fibers showing high diameter and low mechanical properties..